Since I became a professional illustrator, I always used Photoshop as my main drawing app. I developed a solid workflow in Photoshop that allowed me to work for newspapers where you need to work very fast and be effective. Last year, I started to work with Jose on animations and that required vector illustrations. At the beginning, I kept working with Photoshop and then vectorising the resulting images using Vector Magic and Illustrator. But after a while, I realized that that system required to invest a substantial amount of time to do the conversion and the results weren’t optimized for the animation process either. I decided then to start using Illustrator to creating the illustrations for animations. I still used the sketch made in Photoshop as a guide. At the beginning everything was a bit confusing, I had to adapt my mindset to a new environment. The rules were different, the tools were different, and even the interaction was different. The switch from Photoshop to Illustrator didn’t come alone. It wasn’t very comfortable to keep using the Cintiq tablet anymore, so I started using a mouse. It wasn’t the first time I used Illustrator, I was familiar with it, but I never created a complete illustration from scratch in Illustrator. I faced a lot of challenges from the very beginning. I always used graphic tablets and switching to a mouse was tricky. Probably, this has been the most important one. I love to work in Photoshop because it’s like painting with superpowers, very natural. The mouse is the opposite, but it also has benefits, I’m still adapting to it. In Photoshop, layers were essential for developing illustrations. It looks like the layers in Illustrator look more like the layers folders in Photoshop. The elements inside of the layers in Illustrator would be the layers in Photoshop. Instead, the Pen tool, Shapes and Pathfinder are the ones that I use the most. It challenges the older system of one file per document, and it has a significant impact on the folder structure system. I definitely miss GuideGuide plugin for Photoshop. I’ve created an Illustrator Action that achieves the same thing, but it’s not as flexible. Canvas Rotation tool not available I love how Photoshop allows you to temporary rotate the canvas while you draw. It’s true that the way of working in Illustrator is more unnatural, and it’s not as useful, but I hope Adobe implements it at some point in Illustrator as well. It took me some time to realise the options of the Transformation panel “Scale Rectangle Corners” and “Scale Strokes & Effects”. I experimented some errors because those options were unchecked. After a while, I find those options very helpful. Pixel Grid It also took me time to get familiar with the “Align to Pixel Grid” option, I also had errors with some shapes because I didn’t know about that option. After some weeks of experimenting with Illustrator, I feel comfortable, and my speed is increasing. I’m slowly polishing my workflow in Illustrator, learning new tools, shortcuts and even using some Actions. Switching to Illustrator comes with a lot of bonuses as well. The very reduced file size, the possibility of exporting any size and resolution or the possibility of having different artworks inside of the same document are great new benefits. I will write about those benefits and discoveries in the following parts. In the Part 2 I share with you how I stopped using Photoshop to create the sketches as well, and what do I use instead. It has been another massive change. Are you a Photoshop or a Illustrator person? Have you switched your primary tools recently? What are you using and how was the process? I would love you to share your experience on the comments! I can highly recommend the shape builder tool – makes the process a lot more manageable. Hiroyuki Sato does some amazing scripts as well that you should check out. Wow, those scripts look amazing! I will give the Shape Builder tool a try. Thank you very much for contributing, Tommy! How nice to read again your articles! I had the opposite experience to yours! In the past I used illustrator to create my graphic work, I used the mouse and the pen tool to almost perfection! However I felt something was missing. I was missing to be the artist I was during my Fine Arts degree…for some reason I thought that crisp illustration would be my thing. But I was wrong! So I parked Illustrator and switched to Photoshop to create my graphic work. I loved the fact that I could get a similar effect to the artists materials, like pastel, charcoal, etc. So I found my way and slowly slowly build up my ‘digital style’ and use this program to combine analogue with digital. As a visual artist, I love getting my hands dirty and starting off any idea or artwork on paper! It’s primordial for my practice and evolution as an artist. Although now, most of my work is purely work on paper, I do strongly encourage anyone to give that step. There is no Control + Z, which is great, because your ‘mistakes’ are documented, which make a good reference for any reflections & rectifications! That’s my way of sketching…I wonder what’s your new method! As always, a pleasure reading your articles and above all, congratulations on the awards! Te lo mereces!! That’s amazing Sofia! I truly admire people like you because you do the most difficult thing: not only surviving in the digital age with analogue tools but also making your work genuine with that process. I love your work, and I sincerely think that you have found your own voice in that “back to analogue” journey. And that also demonstrates how there are unlimited ways of doing things, and the most important thing is finding what’s our voice and be consistent with it. That brings us closer to who we really are. Thanks for sharing your experience! I’ve enjoyed reading your comment a lot. More articles are coming, it’s a pleasure to have you as a reader!! Nice article again, Magoz! Illustrator is by no means perfect and I actually find myself switching between the two programmes alot still. One advantage with the two programmes is the pen tool is largely the same, so if you’ve got the technique sorted in Illustrator you’ll be fine using it Photoshop too. Registration points is my bug bearer with Illustrator, and my processor really starts to struggle when work gets more complicated. I also jump between mouse and pen, although could you explain more about the reason for switching? Thanks, Liam! That’s true; the pen tool is very similar in both cases. I used it more and more as Photoshop included native vector features in the last versions. You mean the reason of switching from the graphic tablet to the mouse or from Photoshop to Illustrator? 1- I had a Cintiq 13HD and my hand covered up what I was trying to draw. It didn’t happen when I used Photoshop because I used brushes, but in illustrator I’m using other tools, and it’s not comfortable anymore. 2- Precision. A mouse allows me to move the points and bezier curves quicker and more precisely. 3- Simplifying my tools. As I’m a nomadic illustrator, everything needs to be very portable, and now that the Cintiq 13HD is not the best tool, I decided to replace it for another that is smaller and lighter. Glad to hear you switched to Illustrator. Adjusting to layers and artboards structure will sure take time but in the end it will be worth it. Try using Blob Brush Tool (Shift + B) for freehand drawing and sketching, it works well for me and my style. Thank for sharing your ideas, Ivan. The problem with brushes in Illustrator (including the Blog Brush tool) is that they are not accurate and their shape is not 100% the original shape because Illustrator needs to transform the shapes into vectors. On the other hand, Photoshop brushes (even the most basic one, which was the one I used) are very precise a reliable. Hi magoz! I think your works are always amazing and I really admire you. Recently I discover your blog and wow! It’s really useful and interesting what you are saying. I’ve been always an illustrator person, a while ago I tried to add some final touch in photoshop but I realised that it took me to much time. And I preferred to find a solution in Illustrator. Definitely, adding some textures and final details in Photoshop if you work in Illustrator takes a lot of time. I experimented a bit years ago and I gave up because the process was very complex. Before I discover that you worked in Photoshop I always thought that you worked in Illustrator. Your style has that clean and crisp vector look. So I think you made a good choice on moving. I’ve worked with vector all my professional life, started with CorelDraw a long way back, then Freehand and finally Illustrator. I use a wacom tablet, can’t use a mouse for much long anymore, my wrist don’t let me :) and because I work a lot with the blob brush with the pressure option turned on. You should check the plugins of Astute Graphics: http://astutegraphics.com They’re are great, especially VectorScribe is a real time savior. One of the great tools of Illustrator, in my opinion, is the color guide and recolor artwork option. It helps me a lot when choosing the right colors since picking colors it’s not one of my strong suits. Thank you for your contribution, Hugo. I will have a look at those plugins when I have time; they look amazing! I discovered the Recolor Artwork tool the other day looking for emulating the way I used Photoshop for colour management and it works pretty well. I’m still figuring out what’s the best workflow that suits the illustrations I develop. I’m going to publish all my conclusions and process in following articles of this series. If you have any other suggestions or hidden gems, would be awesome to hear them. Thanks again! Just from seeing your work, I had always assumed you worked with vectors in Illustrator, so it was interesting to learn that I had it completely wrong and you were mainly working with the brush tool in Photoshop! I started out last year so I’m still figuring out the best workflow for me. I mainly work with vectors and prefer Illustrator, but I like incorporating textures into my work which has moved me over to Photoshop. Originally I took a split approach, first laying down vector work in Illustrator, and then moving the illustration to Photoshop to incorporate textures at the end. I found it slowed me down to be switching between the two programs, so I’m trying to work entirely in Photoshop now. However, I really miss the ease of working with vectors in Illustrator and still hop back to Illustrator when I can’t find an easy way to do what I need with a shape in Photoshop. Thanks for sharing your thoughts on moving from one to the other. 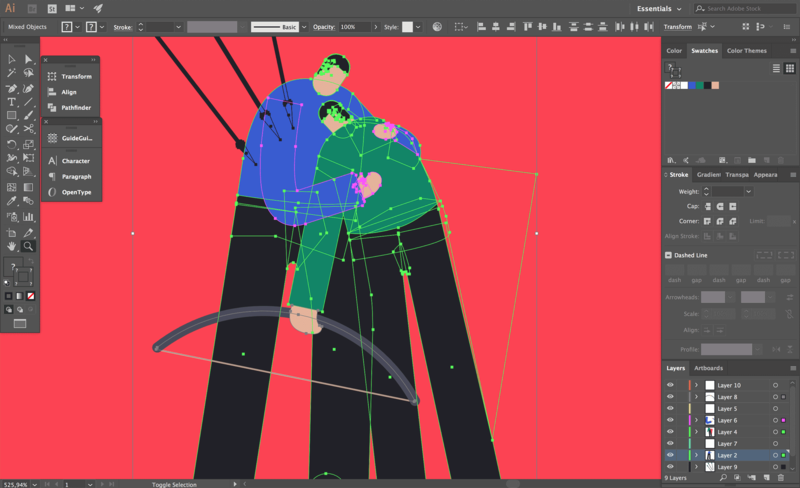 Looking forward to hearing more about how Illustrator’s working out for you in Part 2! Hi Kristen, thanks for sharing your experience! I always thought that, at some point, Photoshop will end up implementing all the Illustrator features. In the last versions, has added a lot of vector functions. They still have to deal with the inconsistency of different shortcuts and tools behaviours between the two platforms, though. The part 2 is coming in a couple of days. I use Illustrator a lot more than Photoshop these days too, but I still use a Wacom tablet. Can be a little janky for accuracy sometimes, but I can’t ever go back to a mouse.